Saudi Arabia’s Acwa Power and China’s Shanghai Electric have signed an engineering, procurement, and construction (EPC) contract for the 700-MW fourth phase of the Mohammed bin Rashid Al Maktoum Solar Park, the largest concentrated solar power (CSP) investment project in the world based on the independent power producer (IPP) model. 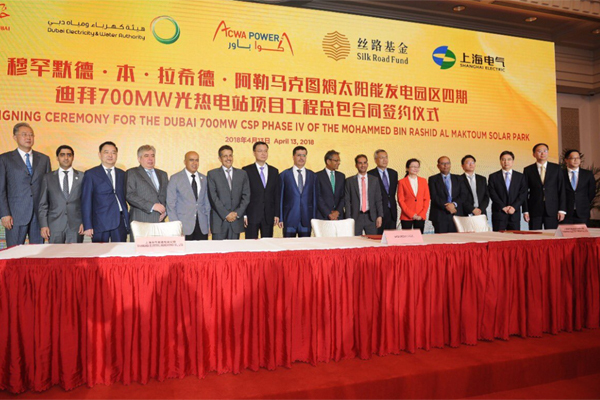 The deal was signed in Shanghai by Mohammad Abdullah Abunayyan, the chairman of Acwa Power, and Cao Min, the president of Shanghai Electric in the presence of Saeed Mohammed Al Tayer, the managing director and CEO of Dubai Electricity and Water Authority (Dewa), Ali Obaid Ali Al Dhaheri, UAE ambassador to China, Turki Al Madi, Saudi ambassador to China, Zhou Bo, the executive vice mayor of Shanghai Municipality, Zheng Jianhua, the chairman of Shanghai Electric Group, in addition to other senior officials. Addressing the gathering, Al Tayer said it is an important milestone that supports the directives of the country's wise leadership to achieve the objectives of the UAE Centennial 2071, the UAE Vision 2021, and the Dubai Plan 2021 to secure a happy and better future." "This marks considerable progress in our efforts to achieve the Dubai Clean Energy Strategy 2050 to provide 75 per cent of Dubai's total power output from clean sources by 2050. This will transform the emirate into a global hub for clean energy and green economy; and consolidate its global position as the city with the lowest carbon footprint in the world," he added. The top Dewa official said Mohammed bin Rashid Al Maktoum Solar Park had a planned capacity of 5,000 MW by 2030, with a total of $13.6 billion in investments to accelerate diversification to clean energy. "It is a key pillar in our strategy, considering that our ambitious targets require at least 42,000 MW of renewable energy by 2050," he noted. According to Al Tayer, the project will feature the world’s tallest solar tower, measuring 260 m, with the largest thermal energy storage capacity. It will allso provide clean energy to over 270,000 residences in Dubai, reducing 1.4 million tonnes of carbon emissions a year.